Rings of Zilfin is an animated fantasy/adventure game based on the save-the-world-from-some-indestructible-overlord-who-plans-to-plunge-the-world-into-darkness theme. The game box includes three single-sided, nonprotected disks, a player's manual, a hint sheet for the beginning player and a sheet to explain the special features of the ST version. The graphics, while not breathtaking, are detailed and varied, making good use of the 16 colors available in the low resolution mode of the ST. All of the towns and villages have a distinct look and their own set of inhabitants and rumor mills. The roads between the towns are rather monotonous, but there are plenty of hint-bearing monks to speak with, creatures to kill and mushrooms to pick. There are a number of special animated sequences that make you feel as if you are living in the game world. You must "earn" the right to see these by completing special tasks or properly using the objects that you obtain along the way. The downside of the graphics appear during combat. There are not enough frames of animation for the characters, causing the animation in this phase to look jerky at best. I also noticed "sparkles" on the screen while walking down the scrolling road—not terrible, but visibly wrong nonetheless. You can play the entire game with the intuitive mouse interface. A window on the right side of the screen contains a list of all valid commands. Moving the mouse up and down highlights your selection, and a press of the left button executes the command. The right mouse button is used to access a secondary menu, allowing you to view the map, save the game or quit the game. I ran into one small mouse-related problem during the walking phase of the game. When you move the mouse up and down to select an item on the menu, you can accidentally move it left or right, thus changing your pace. But this is a small problem that is nearly negated by the status reports on your speed given in the action area at the bottom of the screen. Keyboard equivalent commands for all mouse actions exist. Press the first letter of the command, and it will be executed. The only oddball keystroke is having to press the insert key when the screen states, "Press RETURN to continue." The insert key acts like the left mouse button. It would have made more sense to say, "Click to continue." Three-fourths of the screen is filled with your character and his surroundings. The bottom four lines of the screen inform you of special actions or show status messages. These messages include whether your spell casting was successful, as well as the count of arrows in your quiver. A press of the escape key or selecting Inventory from the menu will bring up a status screen. It lists your possessions, the last place visited and your current direction of travel. While viewing this screen, the game is paused, so you will use it often. It also has a list of every item to be found in the game. There are a number of items to obtain before your quest is complete. Some may be purchased from town merchants and others are received after performing a special task, defeating an especially devious advisory or visiting a hidden location. This makes mapping a necessity. The view map from the menu does not show the location of towns or special areas. I traced the map from the manual and marked towns and special areas as I came upon them. One helpful feature of the game is the adjustable level of play. I played at Level 9, the easiest. The game play itself is not changed for each level; instead you are given more supplies to start with in the higher levels. This feature gives a novice, like myself, the chance to get out of the gate without getting slaughtered. The manual is well written and quite informative. I read it three or four times during various stages of the game to glean new tidbits of information. The hint sheet came in handy at the start of the game without giving away too much. Disk access is acceptable and only occurs when entering and exiting towns. Disk swapping is minimal. You boot with the first disk and replace it with Disk 2 before the actual game begins. 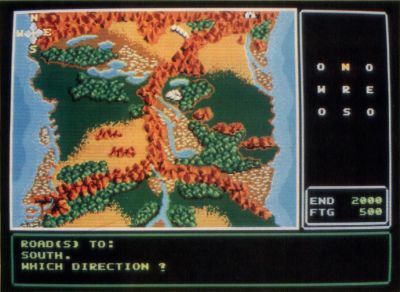 Disk 2 holds the data for the first two-thirds of the game and is used for games saves. Only one game can be saved on the disk, but you can make as many copies of the disk as you need. Disk 3 is requested for the final third of the game and will not be swapped unless you save the game or re-enter one of the earlier towns in the game. Obvious bugs were few, but the game locked up twice under similar circumstances. I would save the game to disk and continue with play by talking to a passerby—when the bombs appeared. Since this always occurred after a game save, I do not consider it a serious bug. I enjoyed Rings of Zilfin so much that I spent three vacation days finishing the game. I would guess it took 20 to 30 hours to complete. I especially recommend this game to those getting started on the road to adventuring because of its logical menu setup, logical and multiple goal obtaining and well-done graphics. Kevin Peck works in the world of MS-DOS by day and plays on his one-meg 520ST at night. He is considering the purchase of a hard disk for his ST so he can get into "serious" ST programming in the near future.